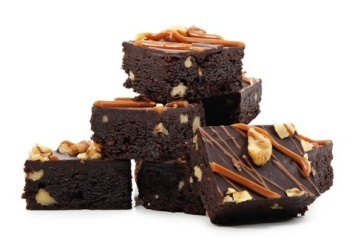 These luscious chocolate brownies have a hidden treat inside. A layer of raspberry jam. The combination of chocolate and raspberry is perfect and one that has been used often. Here the raspberry jam filling adds a tart/sweet fruity taste to the rich and creamy brownie recipe. This recipe comes from a wonderful cookbook called Country Baking Cookbook: Recipes for Freshly Baked Goodies From Grandma’s Kitchen . I have permission to share it with you here. Melt the butter and chocolate in a heavy saucepan over low heat, stirring constantly until smooth. Remove from the heat. Whisk in the sugar, eggs and vanilla. Mix the flour, baking powder and salt in a small bowl. Add to the chocolate mixture and whisk to blend. Stir in the nuts. Pour 2 cups of batter into a buttered 13x9 inch pan (or use the specialty brownie pan shown below for lots of edges). Freeze until firm, about 10 minutes. Spread the preserves over the frozen batter. Spoon the remaining batter over the preserves. Let stand for 20 minutes at room temperature to thaw. Bake at 350°F for 35 minutes or until tester comes out clean. Transfer to a rack to cool. This recipe comes from one of those Gooseberry Patch cookbooks that is full of down home easy to make recipes that you will want to have on hand forever. This is a great recipe for baking with kids. Kids love chocolate and will love helping put together this yummy treat. If you like this recipe, we’d love you to Pin it to Pinterest, Tweet about it, Like it on Facebook and leave a comment and your own recipes below. You will find our other recipe for fudgy chocolate brownies here.